Is your business mobile? 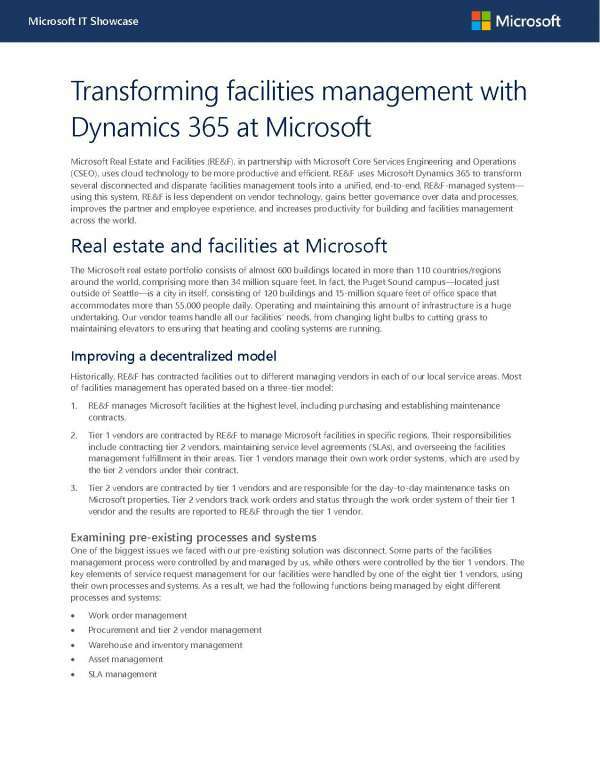 Microsoft Real Estate and Facilities (RE&F) was facing a lack of mobility. The issue slowed productivity and operations and it needed to change. That's when RE&F turned to cloud tech to join disparate management tools to optimize operations. At Breakpoint Technology, we have the resources and know-how to help you find the solution to your mobility issues. With our dedicated team of professionals, we can help you develop a winning strategy. Contact us to find out more. The Microsoft real estate portfolio managed almost 600 buildings located in more than 110 countries and regions around the world. But their lack of agility meant implementing change was tedious and frustrating. They needed to bring their facilities' management tools together. That's when they incorporated Dynamics 365 to unify their dispersed management system. At Breakpoint Technology, we know how to help you aggregate your management solutions so that you can streamline operations and cut out unnecessary management steps. Contact us today to learn more on how we can help.